Happy Friday and April 1st! Anyone have fun pranks up their sleeves for April Fools Day? I wish I could say I did, but I am the WORST prankster, as I end up laughing the whole time, so I can never fool anyone. However, I am extremely happy that April has arrived. It means that the beautiful spring weather will be arriving here in Boston, and actually sticking around. 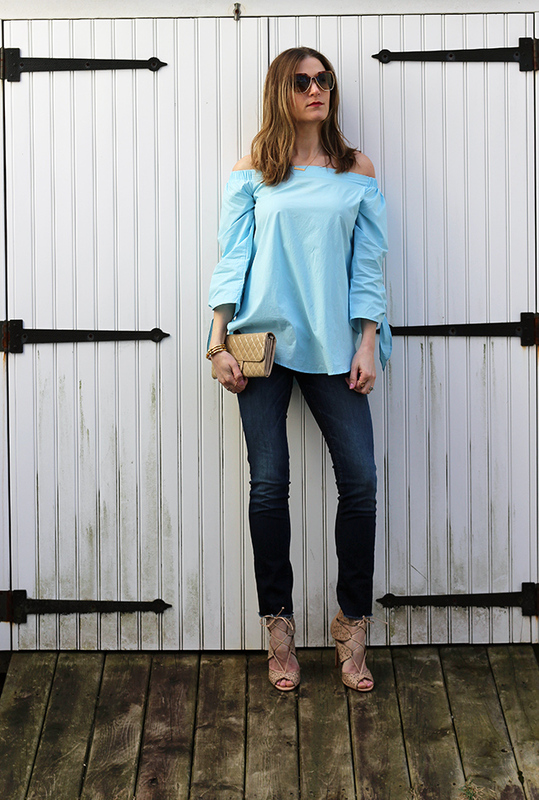 As many of you know about my obsession with all things off the shoulder, the warm weather means I can bare my shoulder nonstop! 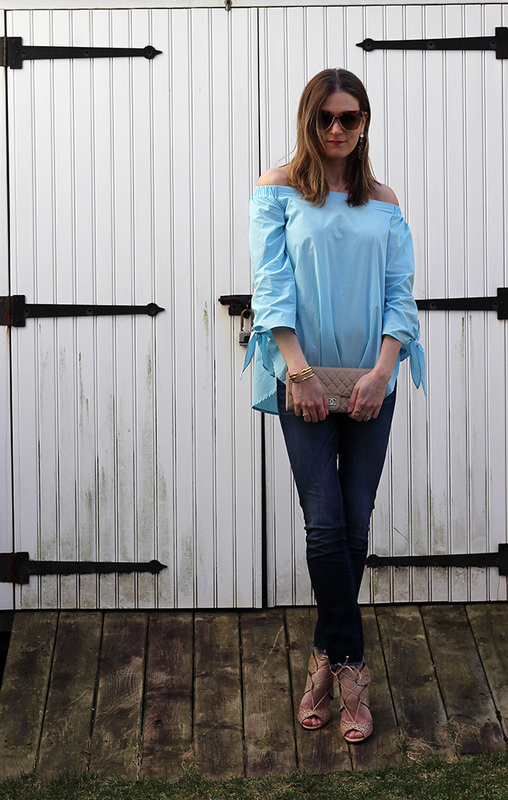 My collection of off the shoulder tops has been growing quite rapidly this season, and this blouse from SheIn is my newest addition. I love this dupe of the Tibi blouse that I have been coveting for two years. 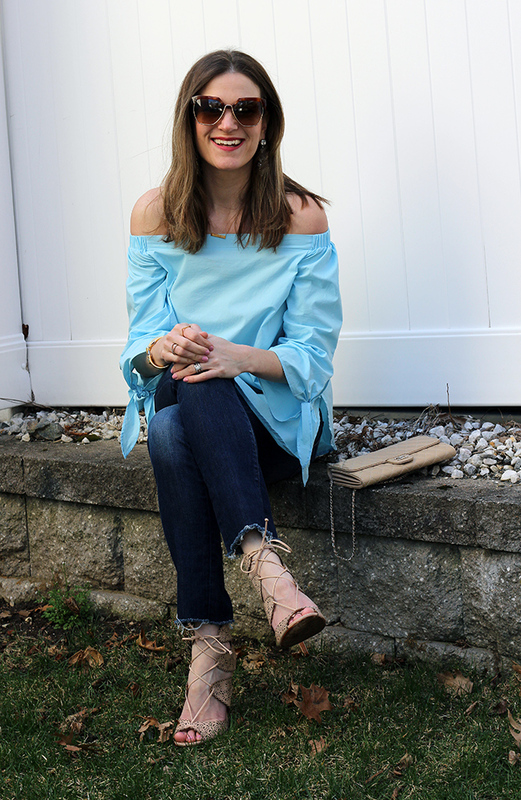 Between the longer length, tie details on the sleeves, and lightweight fabric, it's the perfect summer blouse, and I can't wait to pair with jean shorts. My only complaint is that it wrinkles pretty easily. However, at $25 you can't go wrong. It also comes in white, grey, and navy and these colors are all on sale for $17. No, this is not an April fools joke! I wish everyone a great weekend. My birthday is on Monday, but I'll most likely celebrate the following weekend. I also just found out my licence expires then, so I will be spending my birthday renewing my license, good times. This weeks feature blogger is From Earth to Style. I'm loving her leather skirt and this Easter inspired look! Make sure to stop by and say hello. What a darling top! Love the turquoise color and what a great deal! Love that top! Wishing you a great weekend pretty lady! This top looks fabulous on you, and I'm loving those shoes too! I just got this exact top and it will be on my blog Monday. So great to see how you styled it! I have a growing collection of off-shoulder tops too. They just look so great on everyone! I love this color on you, it's so pretty for spring! Happy weekend! That top is so pretty. I saw it on another blogger too and loved it. It looks so beautiful with your blues. I love love the sandals and statement earrings, here. Gorgeous look! Love your top! SheIn has a lot of trendy clothes at great prices! I love the color of this off the shoulder top and those heels are GORG! Love the shirt! I have the same one love it! You look amazing! Loving this look.. especially those shoes!! Such a cute top and I love how you styled it, fab shoes! Very cute top that is totally your style, and I think your husband takes very decent photos even if he is not trying. The one with you sitting down and smiling is such a great candid. If only I show ones taken by my hubs. Thanks Sheree! He's definitely improved over the year, but the funny thing is, that I actually took these photos myself. What a pretty top and I love those shoes! Love, love, loving it. That's a bummer about it wrinkling easily, but it looks like the fabric handles it well and still looks really cute. I love your jeans! I just made my own frayed hem jeans (I need one or two more washes before the hem has the amount of fraying I want) and love the look. You look fabulous, Rachael! You look gorgeous in this top! Bummer that it wrinkles quickly but it looks so cute in these photos! The top is really fun but I'm super in love with those heels! Thanks for linking-up for Lovely à la Mode!